- Update from any possibility of CFW (CEX). - Ability to Upgrade from OFW 3.55. - Ability to Downgrade from any CFW with QA active Flags. - QA Flags active if previously enabled. - NEW FEATURE - Added COBRA PATCH 7.30! - NEW FEATURE - New look of the XMB (See below). - NEW FEATURE - Introduced 'CyberModding HomebrewStore' the web column. 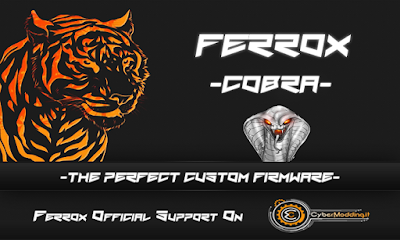 - NEW FEATURE - Brand new Coldboot FERROX COBRA. - FEATURE - Compatibility PS2 games. - FEATURE - Compatibility with the 'latest version of ReactPSN. - FEATURE - RSOD Bypass Screen Console sufferers RSOD. - FEATURE - 4.80 Key to start games signed with 4.80 keys. - FEATURE - XMB Support In-Game Screenshots. - FEATURE - Support Remote Play. - FEATURE - Integrated Package Manager, replaces the classic Install Package Files. - PATCH - LV1: Patched to remove the LV2 protection. - PATCH - LV1: Patched the CoreOS Hash Check to prevent Brick Console Downgradate non-Dehashed. - PATCH - Disabled Cinavia protection.